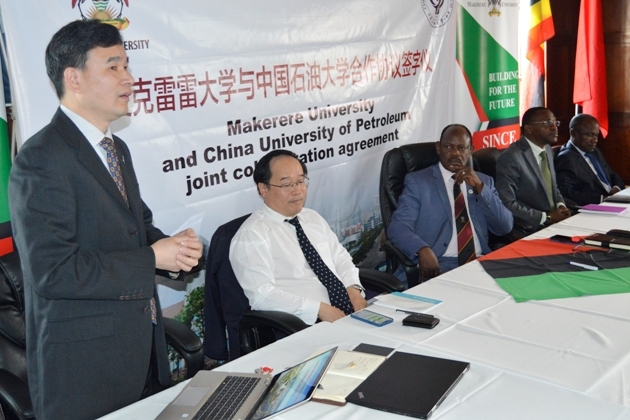 MAKERERE – Makerere University together with the China University of Petroleum (UPC) on January 7, signed an agreement to co-establish and operationalize the Institute of Geoscience and Petroleum at Makerere. 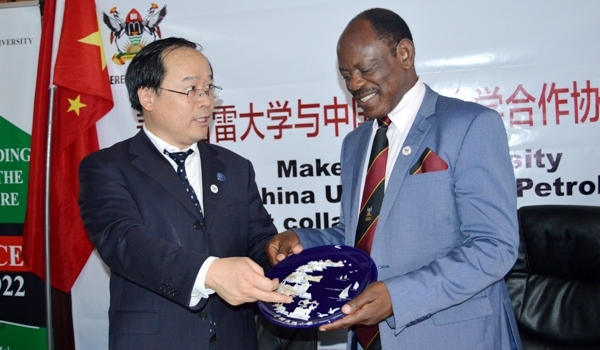 According to statement by the university, the agreement was signed by the Vice Chancellor Prof Barnabas Nawangwe and the Vice President of China University of Petroleum Prof. Jun Yao on behalf of the two universities respectively. The two parties agreed to develop and implement; a curriculum System Construction and Development Plan for both undergraduate and postgraduate-level students of petroleum engineering programs including short professional development courses. Other key issues include teaching – staff training and upgrading plan, Students Joint Education Designing and Implementation plan, Textbooks compiling and development plan, Teaching infrastructure and equipment building plan and Internship base establishment and development plan. China University of Petroleum Training Centre Expansion Plan, joint International Lab Establishment and Development Plan, research Capacity Building and Upgrading Plan and academic Exchange Implementation Plan are key among other issues agreed upon by both parties. The agreement activates the MoU that was signed on December 19, 2017 by the two universities to establish the institute of Geosciences and Petroleum. According to Prof. Nawangwe, Makerere is ready to engage in research and build capacity in the area of oil and gas in Uganda and the region. “We are all aware that Uganda and the nearby countries are exploring oil and they are on the stage of production however, we are facing immense challenges of lack of qualified manpower and expertise in the petroleum industry. Therefore, establishing the Institute of Geosciences and Petroleum at Makerere will be an open opportunity to carry out research and build capacity in this area,” said the Vice Chancellor. In 2009, Makerere introduced the Bachelor of Science programme in Petroleum Geosciences and Production to bridge the knowledge gap that exists in the oil and gas sector in Uganda. The course aims at training Petroleum Geoscientists who can contribute effectively to programmes of exploration and development of petroleum resources. “At the end of the training, we expect our students to be able to identify the key geological features associated with petroleum resources in the context of their discovery and economic viability; execute and interpret information from remote sensing, geological, geophysical and geochemical data during petroleum exploration; apply geological, geophysical and geochemical knowledge in the development of petroleum resources among others,” Prof Nawangwe said. He added that Petroleum resources have been discovered in the region in Uganda and Sudan in particular whereas gas has been discovered in the Songo Songo Island and Mnazi Bay in Tanzania. “There is little experience in the area of petroleum geosciences and production in Uganda and the region as a whole. There is therefore a need to train local human resource in the development and sustainability of the petroleum industry,” added the Vice Chancellor. On his part, Prof. Jun Yao commended Makerere for the tremendous research that is carried out in the area of Science, Technology, Engineering and Mathematics (STEM). He looked forward for a successful implementation and operational journey of the establishment of the Institute of Geosciences and Petroleum at Makerere.